At the Frankfurt Motor Show 2015, Peugeot unveiled its concept cars that in no time began trickling in the eyes of other in segment. We are here talking about the Peugeot 308 R Hybrid 2016. Model is housed with two electric motors and delivers stunning power and performance figures. Let us have a descriptive look at its features and performance through the review of Peugeot 308 R Hybrid 2016. The interior of Peugeot 308 R Hybrid 2016 is equipped with bolstered sports seats featuring fawn-colored painted leather. Looking further and marching our eyes towards the dashboard we’ll notice the fabric cover over it and the door panels. Hearing it from company they say they have used a unique ‘digital weaving technique’ and further add in appreciation of this by saying that it has all attributes that it can be used in working more complex parts where foam can’t be used. Apart from these two I didn’t find anything unique in the interior. The same perforated leather three-spoke steering wheel that features a bit compact design hides behind it two-paddles. However the head-up display mounted in center might interest you. 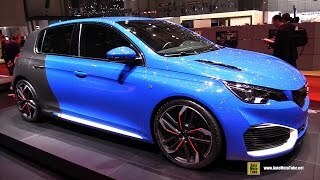 In all rounding up the entire interior details of the Peugeot 308 R Hybrid 2016 I would say it might fascinate some while for some it could be just another knock. This is that one arena of crowd that I loved the most (after it power figures). 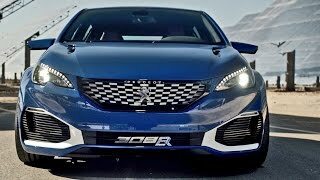 Talking about the exterior of Peugeot 308 R Hybrid 2016 I would say it has lot of anger that will gain commendable attention while rolling down the line. Starting with the front fascia you’ll notice a new checker pattern grille mounted amidst the tiger-eye like headlights. Beneath this there are two massive air intakes. At the rear fascia things are bit of same and echo the legacy of front (apart from rear half being painted in Matte Black). It has a small rear diffuser and single exhaust exit on the right side beneath the bumper. In all talking about the exterior of Peugeot 308 R Hybrid 2016 I would this time prefer giving stars with five being best; the rate from my side is 2.5 stars. 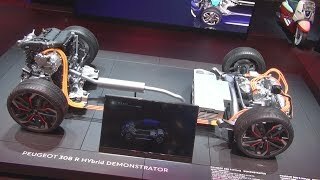 Beneath the hood of Peugeot 308 R Hybrid 2016 is a 1.6 liter THP four cylinder engine paired with two electric motors. The combined output of this system is 493 hp and peak torque is 730 nm. 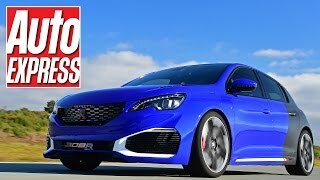 With this power rolling its massive 19” wheels mounted body, the top speed of Peugeot 308 R Hybrid 2016 touched mark of 155 mph while the 0-62 mph sprint can be knocked in just 4.0 seconds only.